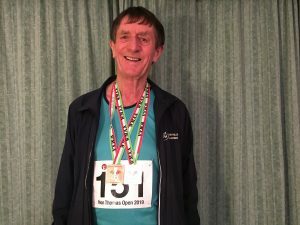 Barrie Roberts reports: Early on Sunday morning 20th January 2019, Katie and I headed for Cardiff, where the Welsh Masters Indoor T&F Championships were taking place. We arrived at the NIAC, Cardiff Met. Cyncoed Campus to find very full car parks, and a very long queue for Registration. Yes, it was a very well supported athletics meeting with a large entry of athletes (M and F) from teenagers to some in their 80s. Running in races, which include different age categories, makes pacing ones performance more challenging. Time keeping is important when competing in championships; not just the time taken to run from A – B,but ensuring that one has e.g. registered for ones event at least 60 minutes before, and is present and correct in the Call Room at least 15 minutes before the Start. Alas, there were some people (not many) who weren’t able to participate, because they were late! The Cardiff Met Organisation (admin, officials and time keepers), headed by James Thie (still a very fine athlete), was superb as were the changing/shower facilities. It is still very early in the year, and performances for many of us will hopefully improve in the weeks and months ahead. I was much faster 5 years ago! Barrie was awarded this week’s Performance of the Week for his double gold-medal winning exploits in Cardiff!